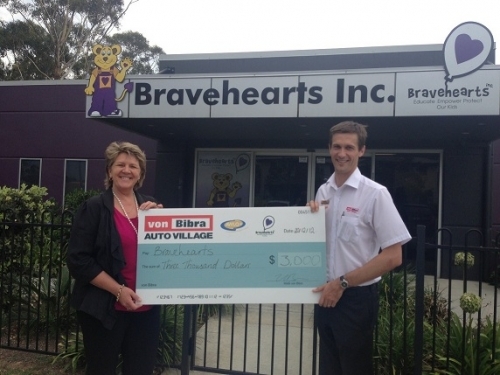 GOLD Coast auto dealer Von Bibra Auto Village will help Bravehearts achieve its vision to make Australia the safest place in the world to raise a child following a sponsorship deal worth up to $60,000 per year. The Group’s General Manager Wade Von Bibra today handed over a $3000 cheque to Bravehearts Founder and Executive Director Hetty Johnston to kick-off the partnership. The Group has pledged $20.00 from each car sold to Bravehearts, with funds going towards the expansion and continual improvement of the child protection advocate’s education, counselling and advocacy services. Bravehearts Founder and Executive Director Hetty Johnston, thanked Von Bibra Group for its support. “We are just very grateful that the Von Bibra Group has chosen Bravehearts as a charity of choice and we are looking forward to working on some joint initiatives over the long-term,” said Ms Johnston. “This is a family-owned local company and one that is well respected in the Gold Coast business community. We congratulate and thank Warren, Wade and all of the staff, who are aware of the work that Bravehearts does in protecting Australian kids. The support comes at a crucial time for Bravehearts, which has experienced a massive 300 per cent spike in enquiries for counselling services, following the announcement of the Royal Commission into child sexual assault. Wade Von Bibra said customers who bought a car were given the choice of two charities they would like the $20.00 to go toward – Bravehearts or the Animal Welfare League Queensland. “We asked staff who they thought would best benefit from our support and Bravehearts was one that kept coming up,” he said. The two organisations will co-brand events, fundraising functions and collaborate on marketing and media opportunities. Von Bibra is a long-standing and reputable Gold Coast business incepted in 1938 and owned and managed by Warren Von Bibra and son Wade. It has four locations – Southport, Ferry Rd, Helensvale and Robina.